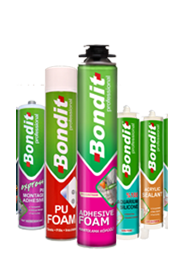 Bondit, being preferred by thousands of professionals in building and construction activities, is strengthening its position in its market day by day. Express Montage Adhesive is a single component, fast curing polyurathane based adhesive It combines high bond strength with fast curing. PU Adhesive Foam is a one component aerosol polyurethane adhesive foam curing swiftly with moisture.